Software modernisation or re-engineering as a concept lacks universal clarity. System Building with APL + Win seeks to clarify this problem by identifying the solution to the long term survival of the APL application as the elimination of APL specific considerations in the choice of a development tool. The author shows how to deploy mainstream industry standard system components within an APL + Win development environment, enabling the APL application to be just like any application on the Windows platform. 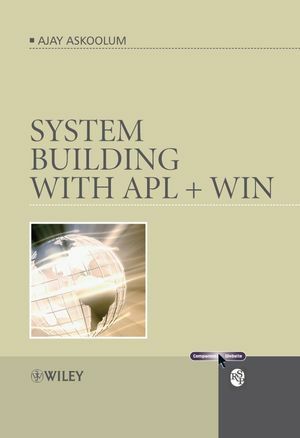 System Building with APL + Win provides an excellent resource for system developers and training providers using the software, as well as MS Office users who wish to incorporate it into a bespoke application development. It will also be of interest to users of other APL interpreters. Ajay Askoolum works for Claybrook Computing Ltd. In Surrey. Having obtained an MSc in Economics, he has worked in the pensions software sector of the UK insurance industry and has over 20 years’ experience using APL andn has authored a number of journal articles on the topic. Chapter 1 - System Building Overview. 1.5 APL interface to components. 1.6 Structured Query Language (SQL). 1.10 APL and Windows API. Chapter 2 - Advanced APL Techniques. 2.1 Removing legacy code clutter. 2.5 APL+Win as an ActiveX Server. Chapter 3 - Application Interface. 3.1 Managing the hidden interface. 3.3 The user interface is the application. 3.6 Help format as a user option. 3.8 User-defined properties of the system object. 3.9 The scope of user documentation. Chapter 4 - Working with Windows. 4.4 The Windows Script Host (WSH). 4.6 Intelligent file operations with API calls. 4.7 Universal Naming Convention (UNC). 4.9 Using INI files with APL. 4.10 XML files for application configuration. Chapter 5 - The Component Object Model. 5.2 APL+Win COM event handling. 5.3 The promise of COM development. 5.4 Types of COM components. 5.6 APL+Win and ActiveX components. 5.7 APL+Win post version 4.0 ActiveX syntax. Chapter 6 - Mixed Language Programming. 6.3 A sample ActiveX DLL project. 6.7 Building a DLL for APL using C# Express 5. Chapter 7 - Application Extension using Scripting. 7.3 Exploring the Script Control. 7.4 Extending the Script Control. 7.6 Sharing with the APL Grid object. 7.7 Concurrent sharing with the Script Control. Chapter 8 - Windows Script Components. 8.2 Building a Script Component using VBScript. 8.3 About the VBS file. 8.4 Runtime errors in script components. 8.7 What is in MULTILANGUAGE.WSC? 8.8 Finally, just because it is possible…. 8.9 The way forward with script components. Chapter 9 - Working with Excel. 9.1 Application or automation server. 9.2 The basic structure of Excel. 9.3 APL arrays and Excel ranges. 9.5 Excel using APL+Win to retrieve APL data. 9.7 The EWA model in action. 9.8 Transferring APL+Win data to Excel. 9.10 Why use Excel with APL? Chapter 10 - Working with Word. 10.4 Word as a report generation component. 10.6 Word vs. Excel for APL+Win automation. Chapter 11 - Working with Access. 11.5 Working with many data sources. 11.8 Unified approach with ADO and SQL. Chapter 12 - Working with ActiveX Data Object (ADO). 12.1 Translating code examples into APL+Win. 12.4 The data source catalogue. Chapter 13 - Data Source Connection Strategies. 13.3 Automating user/system DSN creation. 13.4 The ODBC Data Source Administrator. 13.18 The way forward with the data tier. Chapter 14 - Structured Query Language. Chapter 15 - Application Evolution. 15.4 APL libraries vs UNC names.